Designed and developed for Fascinate 2014, a conference on digital arts at Falmouth, Cornwall, Consequential Spaces is an interactive experiential installation exploring the unintentional consequences brought about by the shipping industry. It draws inspiration from the impact of ship technology on marine life across oceans, and how minute technological developments can redefine urban landscapes. Reference is drawn from the cobble stone paving of Nantucket, Massachusetts. In the early 1820’s the whaling industry accounted for the shipment of over 27,000 tons of oil from Nantucket to Europe. With each voyage, ships had to load cobble stones from Europe in order to provide ballast during the trans­-Atlantic return journey. Over a few years, cobble stones became abundant in Nantucket resulting into an extensive street paving project, which is now protected by law, started as a consequential detail but eventually became part of a spatial identity. 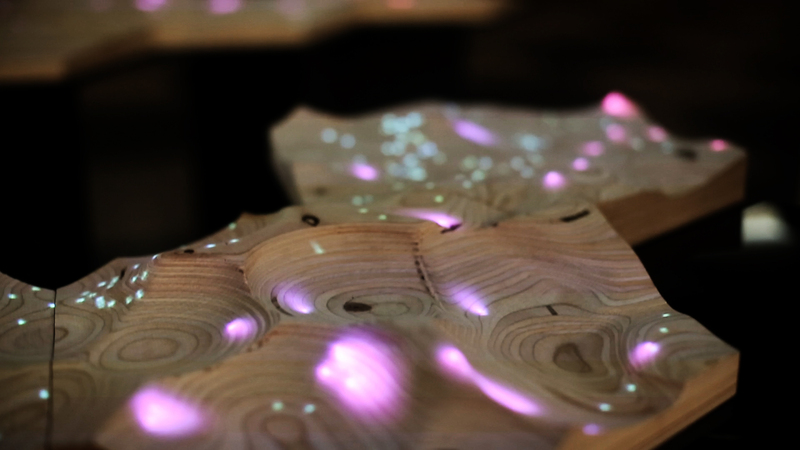 The installation highlights such consequential process by means of a reactive projection onto 14 surfaces which were generatively designed through worldwide shipping routes and CNC milled in plywood. A digital ecology of primitive geometries was projected, responding to the grains and dark shades of the plywood. Visitors could influence the behaviour of the primitive geometries by moving their hands over the surfaces. This contributed to the creation of a consequential behaviour by the end of the exhibition, emerging from a combination of designed parameters and unintended actions by the public.